Now this project is getting me a bit frustrated. The Battle Of Midway took (stretching it) three days. This project has now taken over a year. There is now only two kits left and I've started on one of them. So why the frustration? Although done an over with I'm not quite happy with the result. Primarily it's an old kit and not up to today's standard. 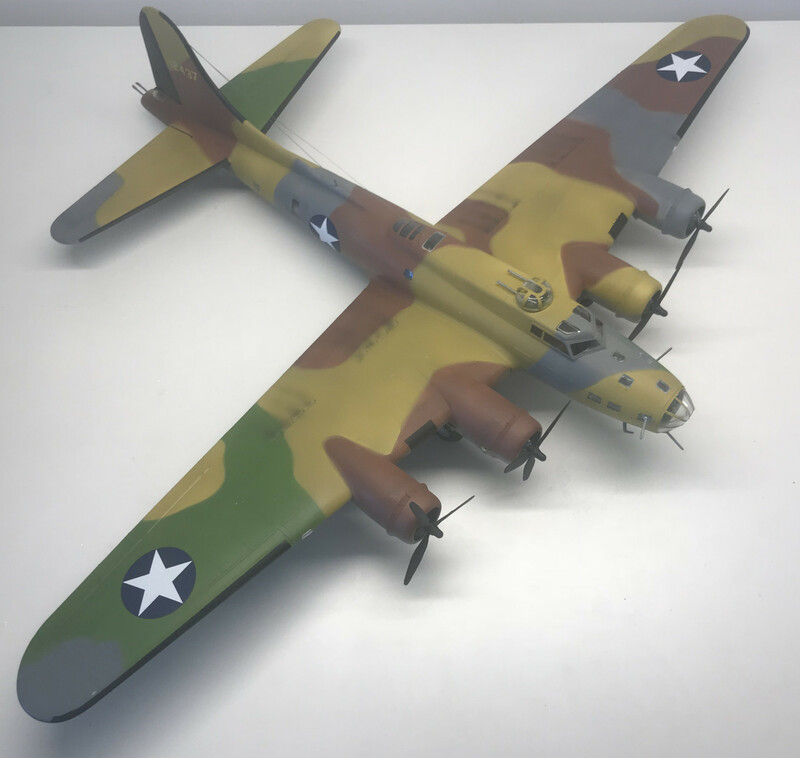 On top of that some conversion was needed (turning the B-17F kit into a B-17E) and I'm not very good at scratch building. I had some help by getting hold of the nose dome but the rest was really a bit over my head. Specially the Bendix belly turret. Also the colours turned out to be a challenge. There's no real references except from the colour photos from John Fords documentary of the battle. The camouflage was applied at the Oahu airbase on Hawaii after the war broke out and were more a local spur of the moment than an official US Army standard. Many references says that the brown was a rust brown so I used that. On the whole I'm not satisfied. Should I do it again It would turn out a lot better but I don't have the resources (specially not a second nose dome) or the perseverance to do it again so this one has to do. Next one was to be the E8N Dave. As I've written earlier I bought a Nakajima E8N1 Dave. I was a bit hasty as I realized I needed an E8N2. Also I did extensive internet searches for information (and preferably pictures) of Daves from the Battle Of Midway. The only snippet I managed to find was in a few books they mentioned that at Dave partook in the primary search pattern that the Japanese sent out on the morning of June 4. It was a plane from the battleship Haruna. Then I thought I've found a mention of several Daves that had been sent out. Amongst other the battleship Kirishima and the kit I had pictured a Dave from that battleship. Happily I started the kit. But then on a second look I found that the information on several Daves in a search came from Pearl Harbour and not Midway. I also noted that the battle order for Midway states that the Daves aboard the Kirishima was E8N2's so the E8N1's had been replaced by then. So I finished the kit but will not include it in the project. Later I could of course get hold of an E8N2 but the rigging on this kit was a pain and I still don't have any documentation for Midway markings so I think I'll give it a miss. The last frustration at moment is that I have a Yokosuka D4Y1 'Judy' in the mail. It has been on it's way from Japan for a month now. As this will be my next kit in the series I'm starting to get a bit upset over the mail services. Then there is the already started Douglas SBD-3 Dauntless as the finish line. As far as I know there will only be two kits missing when I'm done. First the E8N2 as mentioned above who's only contribution in the battle was a scouting sortie without any results. 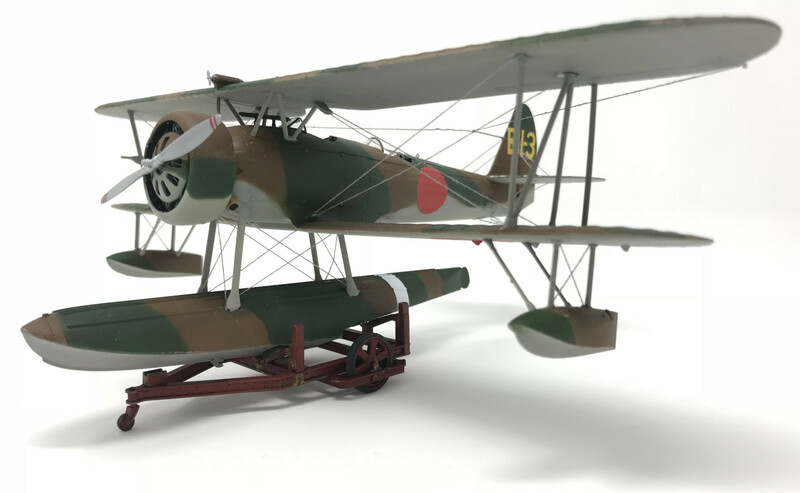 The second will be the Grumman J2F Duck. It's only claim to fame at Midway was that the only one present (a liaison plane) was bombed to oblivion by the Japanese.